“I hate it,” Charlie Brown once said, “when there are two sides to a story,” and on that basis, Charlie might be flummoxed by Christopher Demos-Brown’s new play, “American Hero.” The show, which examines not two but multiple facets of heroism and patriotism, will be presented at the George Street Playhouse on the Rutgers campus in New Brunswick from Jan. 30 through Feb. 25. “American Son,” the first play in what is to be a trilogy by this writer, was well received at George Street last season. In American Hero, an Iraq war hero’s perfect life starts to unravel when a fellow veteran seeking justice shows up threatening to expose a hidden past. From the author of last season’s American Son, this raw, gritty drama shines a light on how America honors its veterans, the corrupting effect of awards and commendations, and questions what it truly means to be a hero. American Hero joins American Son and a yet-to-be titled new work to create a trilogy of plays exploring American injustice. 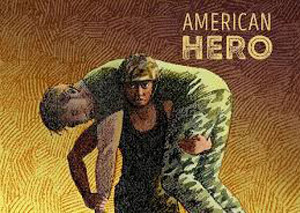 American Hero is the recipient of the Steinberg Award Citation from the American Theatre Critics Association. “This is a playwright who crafts smart, insightful dialogue and memorable characters in service of compelling, engagingly theatrical stories.” – Miami Herald. Playhouse favorites John Bolger (last season’s American Son, 2014’s Outside Mullingar) and Armand Schultz (The Spitfire Grill, Jolson Sings Again), as well as Broadway’s Kally Duling (Fun Home) and Laiona Michelle (Amazing Grace) have been cast in this gripping military drama American Hero on stage through February 25.